The new skilled labour radar provides well-founded instruments to analyse the skilled labour shortage in Austria. It builds on comprehensive secondary statistical evaluations and a nationwide survey among around 4 500 companies. The analyses, conducted by ibw Austria – Research & Development in VET on behalf of WKÖ, provide information on issues such as how many skilled workers there are for each current vacancy and how many will be available in the future. The results show that the skilled labour shortage is already being felt by almost all Austrian companies (87%) in the first half of 2018. This increases in the workload of entrepreneurs and current staff, compromises the quality of service provision, reduces customer satisfaction and leads to a clear decline in the economic success of Austrian companies (fall in sales and higher costs). The skilled labour shortage has been felt particularly in medium-sized companies, in tourism, in artisanal/technical fields and regionally in the western part of Austria. 59% of current vacancies for skilled labour have not been filled for more than six months. Last year, companies already faced a clear fall in the number and quality of job applications, with the time and money required to search for staff increasing significantly. Extrapolated across Austria, it can be assumed that there was an estimated demand for skilled labour of around 162 000 people (among all member companies of WKÖ) at the time of survey (April 2018). 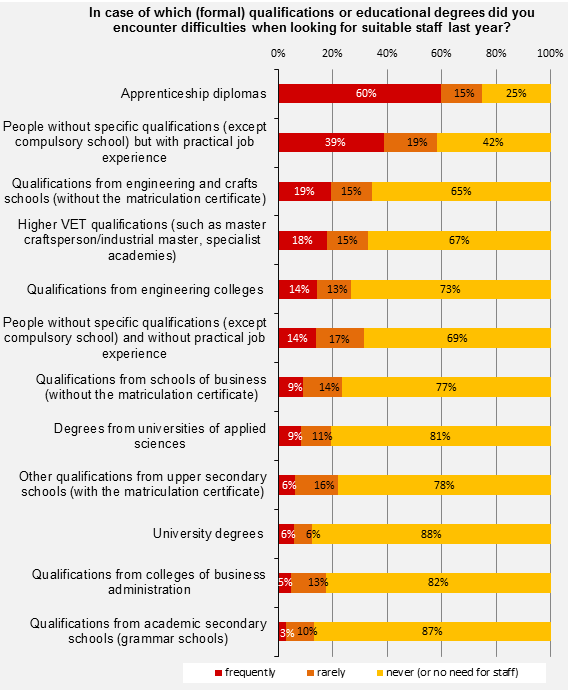 Apprenticeship diplomas are especially in demand (see Diagram 1). 60% of companies with a confirmed skilled labour shortage frequently encountered difficulties last year in their search for staff with apprenticeship diplomas: this compares with only 9% when searching for graduates from universities of applied sciences and 6% in case of university graduates. The situation has become worse in recent years because of the decline in the number of apprentices, mainly due to demographic reasons. This does not reflect a lack of willingness to provide training on the part of Austrian companies. On the contrary: around half of the companies (38% clearly, another 22% perhaps) would train a greater number of apprentices if they could find sufficiently qualified and interested young people for their jobs. Among those companies which, in principle, train apprentices, as many as 46% definitely wanted to train more apprentices and 27% perhaps.